While some consider the pool area as a recreational space, some see it as a personal oasis. Everyone needs a private place where they can let everything go and just find calm and inner peace. The presence of water in the pool makes the pool deck a perfect place to transform into a personal oasis. Wherever you look, there are Pinterest boards showing cool suggestions, there are posters and magazine articles showcasing trending pool deck designs. Despite the numerous sources of inspiring designs, the only thing that will work is what inspires you personally. Do not be easily swayed by what other people say. If your heart thinks that something will work for you, then that is the best choice. The design and the materials you use should be something that you feel happy about. Why start from scratch? Not only will that consume a lot of your time and energy, it will also cost a lot. If you have a concrete pool deck, work around it. 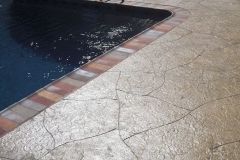 If the utilitarian look is not your thing, a pool deck refinishing could alter the look of the deck to your liking. It can be stained to a color that you find more relaxing or inspiring. If you already have furniture on the deck, try to make them more comfortable. Your personal oasis should promote the most comfort you can get to make the transformation effective. You can swap furniture with what you have inside your home, rearrange the setup, and add decorative accents. Your personal oasis can be as decorative as you want it to be if you think that works for you. But do not ever think that you have to invest an exorbitant amount of money in order to achieve that. Get creative. There are decorative options that are cost-effective. The pool deck, for example, does not need expensive tile or stone to look stunning. 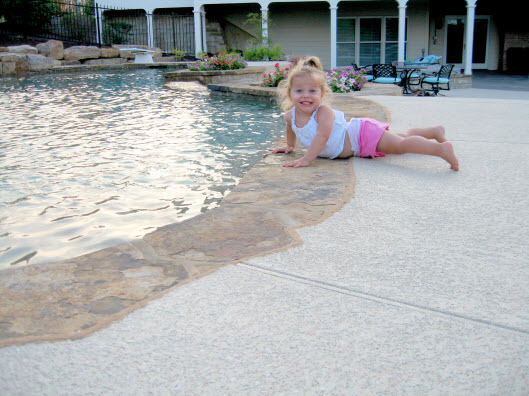 A cheaper alternative that yields the same result is a pool deck resurfacing, either with a stamped overlay or a spray knockdown finish. If you are quite crafty, now is the best time to use it. Create or alter things that will make your oasis inspiring. Besides, buying expensive stuff will only stress you out and that will totally defeat the whole purpose of a relaxing pool deck oasis.